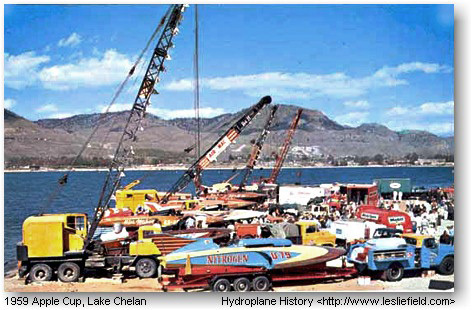 Welcome to the Hydroplane History website. We'll be updating the site frequently so we hope you'll visit often. Nearly every small image is hyperlinked to a larger version. (Click on the small image and a larger one will be displayed). With the last update the website contains 2604 pages of text and 2043 images so there's much to see. Click around and have fun. NOTE: I've switched over to a new webhost (Dreamhost) and I'm moving from the html editor I've used for 17 years (FrontPage) to Dreamweaver. Frames will finally be eliminated and standards will be implemented -- I'm taking the leap to HTML5 and CSS3. The content will be reorganized considerably. After the updating of current pages I'll start adding new material -- stats, race reports and much else. I also have a large collection of race videos that will be digitized and streamed. All hydro nuts are welcome to join the group. This site uses frames but it should work in all modern browsers including Firefox, Internet Explorer, Opera and Safari. Please report any display problems or other errors, Optimized for 800x600 pixel display or higher. A non-frames version is available. Your comments and suggestions are appreciated. This page was last revised Thursday, April 12, 2015. Please Note: This site was created by a fan who loves the sport. This website is for educational purposes only and has no commercial intent. All material is presented under "fair use" guidelines. I am not trying to compete with or supplant any other site. Material has come to me from a variety of sources. It is not my intention to violate copyright or to compromise the efforts of other individuals, organizations or commercial enterprises. Copyright for reprinted material remains with the original author or publisher unless specifically noted to the contrary. The copyright notice at the bottom of a page refers to the assembly and presentation of material, not the source material itself. Please address any concerns to me at wildturnip@gmail.com.